Toyota recently announced its new Mirai. I am glad to see the open-sourced some patents. I wish them well. I believe it would have been more successful had they done this 10 years ago, before the Mobile revolution. 1. 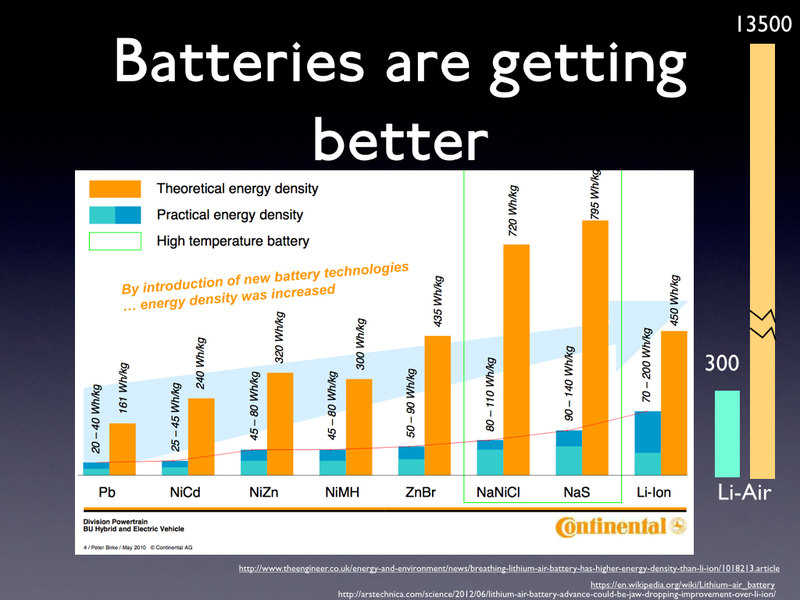 There are more complementary investments in battery research and production due to consumer electronics driving down weight and driving up performance. Where weight and power matter most (your phone, your tablet) people demand and firms are competing on lower weight, higher performance, and longer time between recharges. That has huge positive spillovers for electric vehicles. Fuel cells for transportation have no comparable investments in other sectors spending resources to improve the technology with transportation spillovers. The mobile devices market will be larger than the car market (Obviously a car is bigger and more expensive than a phone, but people buy phones and tablets more frequently and in greater numbers). See also my presentation on the Future of Energy to the AGI meeting this past November, and my earlier articles: Electric Avenue in Foreign Affairs, and Electric Antecedents. The energy density is still orders of magnitude higher for a hydrocarbon and a small, highly efficient electric generator such as a direct fueled turbine or possibly even a small external combustion steam turbine system. That seems to me to be the interim technology that we need.